Eze sur mer, gem of the French Riviera, is ideal if you are looking for a relaxing time, not too far from it all, but with nature nearby! This typical local villa is perfect for a family vacation or for a friends gathering, with very easy parking inside the villa, great views, terraces and all the modern comfort to expect with a hint of a very local feeling. The villa is a 3 storey house, and can be rented in full, to accomodate 8 people maximum. However, the 3 bedroom apartment is the upper level of the villa, with a super romantic bedroom in the tower, small bathroom and great terrace with a view. Kitchen has been fully remodeled last year, offers great light, and has all you need to cook a great French meal any season. The living area is very open, with typical bow windows, sea views, lots of light. Off course, it opens to a nice terrace with outdoor furniture to enjoy lunch or dinner if the sun is out, which is not too difficult to have around here ! Again, it's a very typical architecture and style villa, which offers a great feeling in the living and dining area : an old Europe kind of feeling, but bright and sunny. The main bedroom has a queen size bed, nice view on the pine trees and the sea in the back. From this bedroom you will access the second bedroom, with twin beds and a small bathroom corner, with sink and loo. This second bedroom is a great option for children, as they'll have to cross the master bedroom to access this bedroom. Of course, there is a door separating those 2 bedrooms. The third bedroom as mentionned, is in the Tower, with an independant entrance, double bed, loo and sink, and a great large square terrace to enjoy a drink, read a book, or just relax. 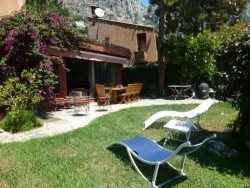 This third bedroom is ideal if your group is made of 2 couples, or if you have teenagers that would like to have a little independance, as the tower is attached to the villa but one floor higher and with a separate entrance. Can also be ideal for a nanny if needed. Space, light, sun, outdoor, all the modern amenities, and very roomy. We do recommend to have a car, as the sea and beaches are down hill : if you like to walk it's only a 10/15 mn's walk down hill, but you will have to climb back up which might take a little more time. In Eze sur Mer, you will find a couple of nice restaurants, like La Vieille Maison by the train station : family food, fresh and tasty, ideal for lunch and dinner in season, but also for a great breakfast and if you'd like to meet the locals, as it's our favorite hangout ! Momo and Christine also to take away if you order, and if you are planning lunch on the beach, they do the best and biggest sandwiches you will find in the area. On the beach and in season, famous Anjuna Beach Restaurant, with private beach, great food, music and lots of fun. Next door, you can also try Papaya Beach. For groceries, you will have to drive 5 mn to Beaulieu sur Mer large super market : you can also order online, and have a delivery. Beaulieu also has a daily dairy market, easy to find. On Saturdays, in addition to the dairy, you will find local products, honey, olive oil, great cheeses, and also clothes, jewlery and more. Beaulieu also has lots of shops, restaurants, beaches. In approx 20 mn's drive max, from the villa you will reach Monaco or Nice. Again, perfect location if you would like to explore the area, meet the crowds and come back to a more quiet and relaxing environment. We only give spotless places that we would put our own family in. Should you be needing something, we're only minutes away to help. Check in time is very flexible : if you arrive before 5 pm and the apartment is not ready, you can drop your luggage and come back later on. Check out is at 10 am maximum unless agreed so. Flexible change over days too, special arrangements will be made if you arrive on a Sunday. A 30 % down payment is required to secure booking, balance is due 60 days prior to arrival. Security deposit is only held on Credit Card authorization and released after departure if everything is in order. Final cleaning includes normal cleaning and all linens/towels/beach towels cleaning. Electricity, water, internet, linens are included as well as cleaning starting kit and kitchen essentials.